Drifting first excited me in the early 2000's. Growing up watching Grip Video, JDM Insider, and Mischief movies. It's hard for me to specifically name my inspirations because I feel like its a culmination of all the people I grew up watching street drift either in person or on the internet (US and Japan). Some of them were/are well known but many of them are not. There are so many inspirational cars and drivers even if they only have 1 or 2 clips of existence on the internet. I had plans of how I wanted to build my cars and basically just wanted to drive as much as possible. Aside from that I just went with the flow. My first experiences with drifting started around 2007 doing FF handbrake drifting on gravel roads and in the snow. Not all that cool but it was all I had available to me at the time and it helped me get comfortable behind the wheel. Soon after, I had a couple of friends who started to let me drift their cars, an S13 and a 300zx. My first drift car I bought was a 240sx hatchback which had a handful of modifications and a 300+hp KA24E setup. I really only got to experience snow drifting with it before it broke and basically sat for the next 2 years, until I decided to sell it. In the meantime I purchased that 300zx my friend had let me practice in. I got some good seat time in the Z over the next year before buying my Miata in 2011. Once I moved into the city (Chicago) and bought my Miata, drifting really took off for me. I began driving events and meeting people with the same passion as mine. My team Street Dancer was formed. 2011 was all about seat time. When I purchased the Miata it had already been a long time local drift car and therefore had a decent but simple setup: stock 1.8 engine, Stance prototype coils, 2way lsd, roll bar, bucket seat, steering wheel and a non working handbrake. I chose to only do minor exterior changes such as a lip and wheels, so I could keep focus on driving. I believe this lower power, no ebrake setup truly helped me form the driving style I have today. 2012 came and I was ready to dress up the Miata. Modifications included: aero, hood, trunk, wheels, brakes, cooling, bushings, knuckles. This is when I painted the car blue. As of 2018, aside from aero, the car has not been repainted since. I continued to street drift and attend as many track events as possible. 2013 I changed the mirrors, headlights, and tail lights. Also bought fresh Stance coils as my original coils had over 100k miles on them. I also fixed my handbrake at the end of the year. Basically just kept on driving. In 2014 I decided I was ready for more power and 13b turbo swapped my Miata at Shook Engineering. I also picked up an IS300 to daily and drift during this time. I used the the IS300 for Final Bout 1. Shortly after, the Rotary swap was finished. I had also spent the year importing parts via GTR Garage. At this time the Miata now had Arios aero with the pink stripe at the bottom. The car finally felt complete to me. This overall stage of the car, the styling and 13b engine setup, was my ultimate vision and dream that I had thought up when I first bought the Miata. 2015 I had the opportunity to live in Japan for 3 months and work with GTR Garage. This is where I acquired my pink R32(previously grey). It came equipped with SR20DET, aero, wheels, suspension and other small things. A ready to go drift car in great condition. I had the opportunity to drive/drift multiple chassis in Japan such as 180sx, S14, C33, Soarer, Miata, and of course my own Skylines. I drove my R32 across Japan from Yamaguchi area to Hiroshima, Osaka, Kyoto and Nagoya. I was able to experience many tracks, touge/street spots in each of these areas. Often times with pro level/well known drivers around to give tips and show off their skill. I also made stops at many well known shops throughout Japan as well. The knowledge and experience gained on this voyage seriously changed my life not only for drifting but on a personal level too. I had always been into and followed the Japanese culture/car culture growing up, but to have actually experienced this level of car building and driving skill was just incredible to me. 2015.5 Back in Chicago now, I resumed driving my Miata and also my R32 in the same form as it was in Japan. But shortly before FinalBout 2, I decided to move forward with my plans to change the look of the car. I made custom exhaust, custom intercooler piping, equipped BN aero, changed wheels and painted it pink. The plan from the beginning was to have blue/pink for my cars and specifically Miata/R32 combination, inspiration stemming from "that one photo" of the red R32/Miata in the snow in Japan. Towards the end of the season I equipped all Stance Suspension arms, solid steering bushing and it really increased the overall handling of the R32. 2016 GLEAM was formed. A combination of Street Dancer and Moon Lighter teams. I finalized my main exterior plans for the R32 with mirrors, trunk spoiler, and roof spoiler. Both cars were now at a comfortable point "build" wise and could just focus on driving as much as possible. I did an insane amount of street drifting this year. I look back and think this was my most active and fun year in drifting even to this day(Dec 2018). 2017 I changed back to PS Duce aero on the Miata. R32 wise I swapped my s14 turbo for S15 , added Tomei Poncams and Tomei turbo elbow for cooler sounds. Drove many events and lots of streeting. 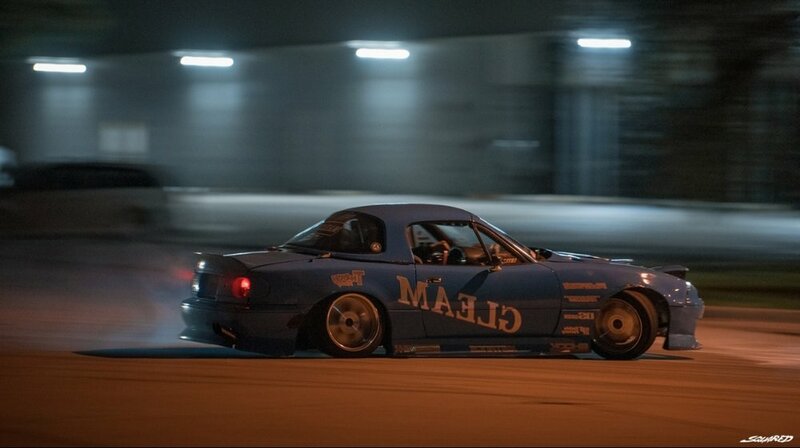 Before Final Bout 3 I changed to a more aggressive knuckle and added livery on the Miata. On the R32 I added knuckles and changed to Uras aero. I try to keep an equal balance between driving both cars but this year I favored the R32. This is mainly because it has more storage space for carrying spare wheels/tools for streeting. 2018 began with traveling to California for Super D Matsuri. Miata experienced mechanical troubles and didn't see as much track time as I was hoping. I drove the R32 as well but took it easy because I was planning on cruising it around California directly after the event, which I did. Overall amazing experience. I focused more on streeting over local track events. Super D Midwest happened, I took home 4th place and best overall driver award. This year I found myself using the Miata more again which felt great.